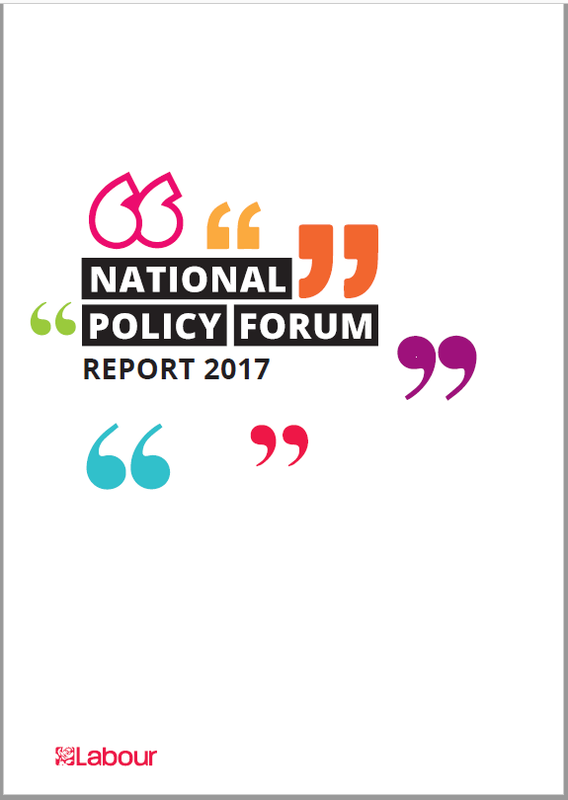 The NPF Annual Report was quietly released on 3rd August by placing it on membersnet but making no announcement of the fact. Would it have been so hard to email members to tell them the document is now available? Despite this publicity-shy approach (the report was not even available on the Policy Forum website at the time of writing) we are told in the opening pages: “We want as many people as possible to get involved … Together we can build a policy platform to tackle the challenges our country faces …”. You can download the full annual report here. If you have not got time to read the whole thing but would like to focus on one or more of the policy areas covered by the eight policy commissions, then here are the separate reports for printing separately: Early Years, Education and Skills, Economy, Business and Trade, Environment, Energy and Culture, Health and Care, Housing, Local Government and Transport, International, Justice and Home Affairs, Work, Pensions and Equality. The text of the reports varies between four and six pages. I will review the Early Years, Education and Skills report below. I hope that others will take up the challenge to do the same for the other seven policy areas. It needs to be done quickly since the Annual Report will be considered at the Annual Conference starting on 24th September. The most striking thing about this document is its non-committal tone. The Commission started its work at a seminar at the 2016 Annual Conference. There, we are told, “the topic of university living costs, particularly with regard to accommodation, was raised” and that is all we are told. Nothing about tuition fees was apparently said. No potential solutions are mentioned. The whole of the section reporting the meetings of the Commission continues in this vein. In November “key challenges were identified”, these being childcare costs, fragmentation of the school system and the narrowing curriculum, modern childcare, children’s social care, safeguarding, social mobility, further education, careers services and apprenticeships. As to what materials were presented and what potential solutions were considered we are told nothing. And so it continues. The “newly reconstituted Commission” met for the first time in February 2017. Angela Rayner provided an outline of current legislative changes on further education going through Parliament. Mike Kane discussed “areas within schools policy which the shadow frontbench were currently focusing on” such as the teaching workforce, school assessment, school structure and early years pedagogy. Then a “broad discussion surrounding the National Education Service” was held and it was “widely agreed that the activity of the Commission should be based around developing policy under this umbrella”. It is impossible to detect a single definite idea in any of this and we have to ask what is the point of such a report? And if all these things were being discussed as described why have the materials considered, and the results obtained, however tentative, not been made available to the members? Nearly two pages are filled with this meaningless stuff. The second meeting of the Commission agreed that a new funding formula for schools is needed. There is nothing, however, about what it should look like. On the 2017 Manifesto we are told that Commission members held telephone conferences and that they “considered all policy areas within their remit”. There were “varied contributions and priorities identified” and “many of these” went into the 2017 Manifesto. After that thirteen specific topics are dealt with. Most are covered in one short paragraph. There are no references to documents used or produced. (1) Schools. Labour focuses on standards and not type of school. This is the current version of Labour’s old policy numbing mantra “standards not structures”. The Commission would like to see Labour commit to a review of school assessment and the English Baccalaureate. (2) Universal Free School Meals. The Commission welcomed “Labour’s manifesto commitment” to this. However, anyone who read the manifesto would know that it did no such thing. (3) Teachers. Workload a problem. Labour opposes the public sector pay cap. We need to put trust in teachers and include teachers them in curriculum development work. (4) Early years and childcare. We need better childcare and better support for families and to raise the quality of workforce in early years sector by making it graduate-led. (5) Further Education and apprenticeships. Put FE on an equal footing with HE. More support for people accessing apprenticeships. Apprenticeships should be part of an industry strategy. The Commission says that the 2017 manifesto included “many of the issues” it had raised but we don’t know what there were or whether the Commission provided solutions as well as identifying issues. That’s enough. This material is so vacuous that there is no point in summarising it any more. The entire report is shallow and evasive and gives no sign of any creative policy thinking. How is it possible that neither academies nor free schools get a mention? Labour is against grammar school expansion but will do nothing about existing grammar schools (exactly the same as the policy under Blair). Commission members had a “strong feeling” that Labour should commit to revitalising life-long learning. They also “want to see fairer admissions” for children with special educational needs. On a the schools national funding formula we learn that “Labour supports the principle of a new formula”.Well that’s a relief then. On the problem of skills shortages and Brexit, the Commission has undertaken to “keep a close eye” on developments. Now that we have had time to take in Labour’s advance in the 2017 elections we need to take stock of its achievement in policy terms. The manifesto was certainly a big improvement on previous ones and contained many important commitments. However, it was also very weak on detail and was not without worrying ambiguities. This is nowhere clearer than in its educational section. Even so the manifesto made commitments on such things as targets for apprenticeships at NVQ level 3, free life-long learning, the right of local authorities to create new schools, and much else besides, which are not in the Annual Report. How can a body which is supposed to develop policy be so far behind declared party policies? Just what have Shadow Education Secretary Angela Rayner, who convenes the Commission meetings, the MPs, the elected NPF members and the TU representatives been doing on this Commission? In the absence of any materials on the work of the Commission, apart from this report, it is impossible to tell. If this is educational politics then it is educational politics of a particularly low order. There can be surely be little doubt that education is an area in which Labour could do much to consolidate the gains of 2017. The Tories are divided over grammar schools. The free school straight jacket for creating new schools is not popular. Most people want education to be run within a local authority framework. The curriculum is in a mess. The whole area is crying out for clear thinking, for innovative policies and for the fragmentation of the school system with academies and free schools to be reversed. In the face of this great opportunity the Early Years, Education and Skills Commission has been found entirely wanting. Delegates to conference would be well within their rights to refer this section of the report back and ask for something with clear analysis and detailed policy proposals. That would require, of course, that they have read it and are aware of its very severe shortcomings. Posted in: Education, Labour, Politics. There is a bill still promoted that is going through parliament called the Health Bill, previously the 2015 NHS reinstatement bill. This has been designed by some of Britain’s leading health experts and gets to the heart of taking the NHS out of private hands. It really is the only game in town, and it includes social care provisions. This document is both meaningless and pointless, unless you are happy to leave things as they are and tinker a bit here and there pretending that it would have any meaningful impact on health care. The other factor is, we have all the money we need to provide whatever health care system we choose, unless again we accept Neo-Liberal dogma that governments are the same as households and must balance their budgets, by only spending what they earn. Government such as our’s doesn’t have to earn or raise taxes before it spends, it is the issuer of our currency not a user of it. @Mervyn Hyde. Your comments have nothing to do with anything that I wrote. David: your comment says nothing about my comment. The real fact is that that document that you also commented on is quite worthless even as a discussion document, no detailed investigation about the Tories bill and it’s impacts just vague references about STPs and similar. Stating the obvious about lack of money without what is meant by properly funding the NHS. Which is why I made the point that before anyone says we must raise taxes before we spend, that it is not a problem for us. We have the money what we don’t yet have is a government willing to spend on we need. I have now seen how the confusion arose, I clicked on the link to health care, and responded to that. Once again sorry David I clicked on the link before reading further down your article. Sorry David, have you also written about the NHS? I have just looked back, and seen it was about education. I don’t know how it came about but I was writing to an article relating to the NHS not education. No, I haven’t written about the report from the Health Commission. I hope that someone does. Thanks for the assessment David. It seems we have another case of the waffle I’ve come to expect from the policy commissions. They manage to identify some (although far from all) of the problems but then do nothing to propose any solutions. This is just a waste of everyone’s time. I’ll try to get one written up for energy, climate, and transport policies over the next few days. I’ve already written a critique of the manifesto’s energy policies—some of which should be showing up in an article later this week—in addition to my past submissions to the policy commission so I should have plenty to go off of. A depressing assessment David. I was hoping for so much more this year. Yes, I find this very worrying because (1) it reflects on a complete inability to deliver on the promise to put the members in charge of policy and (2) if Labour is elected with policies in a half-baked state it will not be resilient enough to deal with the enormous obstacles it would face. I hope that others will respond, like C MacMackin, with offers to analyse the reports of the other Commissions so that we can make analyses of all of them available in good time to delegates to the Annual Conference. I have responded in education, C MacMackin will deal with energy and culture. So that leaves six to go. But don’t take my word for it. Please read the report. Have I been too harsh? This initial proposals for the Policy Forum were anodyne and faced a challenge if they were ever going to stimulate substantially thought through proposals. Given Party political divisions – still unresolved, I am sure anything else was possible. Were these anodyne statements not the inevitable outcome of differing philosophical and political perspectives, at a quite general levels, compounded and multiplied when details and integration is sought. My preference would be to take the last Labour Party manifesto combined with any advances offered by future conference resolutions as the new basis for establishing Policy Commissions charged with advancing details. We do however have to face the fact that the best starting point we have – the Labour Party Manifesto – was the product of a Top-Down process and the detailed extensions will similarly engage small numbers. The local Labour party culture of reluctance to address serious policy issues limits the possibilities for wide engagement. In some cases as with my own CLP Chair (and meeting attendees), this extends to the wish not to talk through policy differences at all, or in some cases even to campaign locally using the manifesto as the basis. It is not obvious that we can resolve it nationally and we do not have the culture to resolve it locally. Horizontal alignments become impossible without formed horizontal groups. taking the Manifesto as a minimum area of agreement may be at least a better start. Apologies for not being able to contribute here to the specific areas mentioned. I have detailed understanding of quite a number of narrow aspects, and only general views on so many, many of the other areas. I am not sure what you understand by “This approach” but if you mean that of the NPF then it is difficult to see it as a response to right-wing, top-down methods. It was introduced under Blair as a way of sidelining and controlling debate. Its approach has always been top-down and manipulative with a pretence at consultation. Yes, the “broad church” approach has many difficulties but policies have ultimately to be decided and informed democratic debate is better than top-down manipulation. Reconciliation will not always be attainable in which case every effort must be made to allow all main views to be presented to the members resulting in an informed decision (something never yet tried by Labour). I wonder why you think the policy statements had to be anodyne. I agree about the Manifesto and yes it was a top-down product but an advance nevertheless. Any decent democratic process has to be both top-down and bottom up. Had it been also been able to draw on previous work involving drawing the wider membership into debate it would have been better still (it would not, for example, have included a commitment to Trident renewal). You are right about the enormous reluctance to engage in serious political debate at CLP level. I experience the same thing. That is something which a serious leadership effort should, under the Corbyn leadership, have started to change by now. It hasn’t even been attempted. And by leadership I mean not only Corbyn and McDonnell but all the left-leaning members elected to influential positions. I include in that people elected to the NEC on a left slate. There is no culture of informed political debate in the Labour Party. If the hopes raised by electing a left-wing leader are to be realised then that has to change. I’m afraid that the Annual Report on the Economy, Business and Trade, is describing a political parallel universe to the one I have observed and participated in all year. It is simply full of vague hopes and a truly laughable attempt to suggest that the Economy and Business parts of the 2017 Labour Manifesto somehow reflected and grew out of the “work” of this NPF commission grouping. That the excellent 2017 Manifesto , with its slightly reforming Left Keynsian tack was actually very good , of course bears no connection to the empty verbiage in the dreadful guff from the NPF , in any policy area,(which even a few weeks from the Election was still endlessly asking ludicrously broad questions, rather than offering any serious , research and analysis-based PROPOSALS to deal with the UK’s dire economic situation). Despite the large team of people supposedly behind the stuff churned out by the NPF in all its topic areas – it is hard not to conclude that in fact the superficial verbiage churned out is all done by one or two young labour Head Office staff – people who have been either so frightened to challenge the dominant neoliberal narrative saturating the PLP and Labour machine, still , OR are operating a deliberate policy of ensuring no new policy to challenge that existing narrative actually emerges for Conference to consider. My strong impression is that the excellent Labour Manifesto was produced with NO real connection to the dire farce of the NPF processes at all – but by one or two well known excellent clued up staff on Jeremy’s team. And the only reason it was accepted by the NEC is that this mildly radical document was seen by the Labour Right as a hopelessly Far Left programme that would conveniently destroy the Labour Left and Corbyn in the much predicted “electoral disaster” they all expected. How wrong they were ! The NPF “process” is still utterly hopeless . It needs to be undertaken at its initial core by small , qualified, teams , and based on solid RESEARCH, and analysis, not a collecting together of pious feel-good bromides. Consultation of the broadest type is essential right across the Labour Movement , and business, but AFTER a solid, politically -based, set of proposals have been worked up. The shambolic and fruitless nature of the NPF process is however merely a reflection of the still ongoing political civil war in our party. As long as the NEC and Party Machine and PLP is so saturated by neoliberalism it is unlikely that the excellent 2017 Manifesto will be supported by a serious research-based policy development process. I suspect the task of Left policy development, in line with the “Corbynist” Leftish agenda still lies outside the NPF – “modified ” as this body may be. A task for the CLPD perhaps to co-ordinate ? The manifesto put people at the heart of the economy, echoing many of the concerns raised by the Commission. It committed a future Labour government to more democratic ownership structures to help deliver an economy that works for all. This included the nationalisation and collective ownership of the water, rail and postal sectors, as well as significant parts of the energy sector. It also included giving people a stake in our economy by doubling the size of the cooperative sector and introducing a ‘right to own’, making employees the buyer of first refusal when a company they work for is up for sale. The Commission frequently discussed the need to diversify and re-balance our economy and the means of ownership and this was discussed at length in the manifesto with its belief that greater democratic ownership will deliver for the many and lead to a fairer distribution of wealth. There is nothing like this in the earlier draft. I am convinced that your work had influence. It was supported by at least one influential member of the Commission and, it would seem, was supported by others. It may seem like clutching at straws (and it certainly often feels like it) but I would look for advances wherever they appear even if very inadequately. The Education report is drivel with virtually no saving graces. I think the International report is even worse. So despite the obvious shortcomings should we not look out for anything that we can latch onto as a toehold for progress? Beyond that I want to say that it would be really great if we could discuss the reports reviewed in the article above the line. I hope that there will be an article on each of the reports so that we can discuss each one in turn and not just sound off about the one’s we feel angry about irrespective of what is presented in the review. I have now read the International report carefully and have written a response. C MacMackin is doing something on the Energy and Culture report. I believe that John Penney is working on a response to the Economy report. If there are straws to clutch at then let’s clutch at them! Fair points, David. There is , I admit, indeed at least a smattering of statements in the Economy report which provides some evidence our contributions had some impact. Not even that in most of the other topic areas unfortunately ! As you say, the International report is traditional uncritical pro US hegemony affirmation of the most craven kind – at just the moment when a frankly emotionally unstable US President ramping up the dangerous “who blinks first” sabre rattling rhetoric in the cases of North Korea and the South China sea territorial flashpoints, and the Baltic States and the Ukraine, must be giving the wider public cause to question the UK and Labour remaining in lockstep with US imperialism. I shall have a go at a review of the Economy, Business , and Trade Report. Yes, thanks to David for this. It is dispiriting, to say the least, to be a member of a party now led by those who are in theory in favour of member participation in policy determination, where that has not occurred or even been encouraged. However, the Clause V meeting passed off smoothly, meaning that there was prior agreement to its content, and indeed it was better than many of us expected, but much remains to be done, and we will not have the easy ride we had in the recent election. But time marches on, with conference in about six weeks, and priorities should be directed at shoring up the manifesto, with additional material and argument.Two key issues should also be addressed, firstly how to prevent the £12 bn welfare cuts that have not been costed in the manifesto, and secondly, and urgently in the light of May’s ‘dementia tax’, proposals for the funding for social and residential care. So we need to agree a defensible Mark 2 manifesto at conference, which we may need to use sooner rather than later. But the battle to seriously commit the party to much wider involvement in policy determination must continue, because without it we are not likely to make progress. It feels like there are two parallel policy development processes going on. There is the NPF process which nominally involves the members but in fact produces useless waffle. To the extent that anything concrete is said it stays close to traditional neoliberal constraints. Then we also have some discussion around the shadow economics team, producing more interesting stuff like a report on industrial strategy or alternative ownership models. However, there isn’t even a pretense of member involvement with these documents, nor any attempt to engage the membership in discussing the reports. This fall I’m going to try to get my Momentum branch to discuss the Alternative Models of Ownership report either in a general meeting or during a special event. I think this could be a useful thing to try to get other branches to do as well. Spot on! Peter Rowlands pointed out exactly the same things to me. Yes, I will take this up with my Momentum branch as well. I am not clear just yet with what aim in view since the material you refer to is light years ahead of anything normally discussed in my CLP’s branches (and the NPF). Yes, the documents you refer to are quite good, and I would add that on the National Investment Bank, although it’s not clear to me why this and the ‘Alternative models’ paper is advisory while the ‘Industrial Strategy’ paper, which I think is good, appears to be part of the manifesto. Well, I wasn’t impressed by the section of the industrial strategy paper on energy, particularly the intention for new generating infrastructure to be built in the private sector. The one good thing in there is that the new public energy suppliers will also provide energy efficient devices and services. This was actually something I recommended in my NPF submissions. The reason I didn’t mention the National Investment Bank paper is because if I put more than two links in a comment it gets held up in moderation. Fine, I take that back, as I was very impressed with your paper on energy. I’m not saying the whole document is bad—I haven’t read all of it to know. Even the section on energy was more useful than what was in the manifesto, clarifying what was meant by “regional energy companies” and mentioning numerous technologies which the manifesto ignored. What it lacked was an evaluation of how these technologies should be deployed and the need for public ownership of generators, especially in the case of new nuclear capacity.